Does Google CEO Eric Schmidt even know that his jalopy of a website stopped working for just enough minutes to terrify Sommer Mathis? It's not the kind of advice that will make please the board, nevertheless, the head of the world's most popular search engine urged college graduates to step away from the virtual world and make human connections. 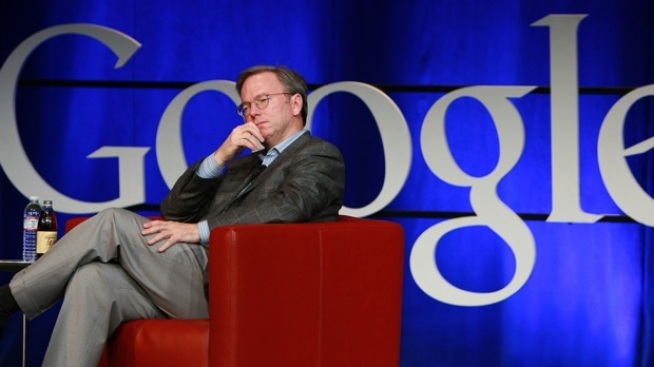 Speaking at the University of Pennsylvania's commencement, Google chairman and CEO Eric Schmidt told about 6,000 graduates that they need to find out what is most important to them -- by living analog for a while. Schmidt, who holds a doctorate from the University of California at Berkeley, also received an honorary doctor of science degree at the ceremony. Penn President Amy Gutmann cited Schmidt's "manifold contributions to putting the world at humanity's fingertips." It was Schmidt's second honorary degree in as many days. On Sunday, he received one at Carnegie Mellon University in Pittsburgh, where he delivered a similar speech. At Penn, Schmidt noted the Ivy League school played a key role in the technological industry by creating ENIAC, one of the world's first electronic computers, in 1946. "Literally everything that you see -- every computer, every mobile phone, every device -- descends from the principles that were invented right here," Schmidt said. "You can't plan innovation or inspiration, but you can be ready for it, and when you see it you can jump on it and you can make a difference," he said. The Class of 2009 is graduating in a tough economic climate, but such downturns can be a time for innovation, Schmidt said. He noted that Rice Krispies, Twinkies and beer cans were all products of the Great Depression -- not to mention staples of college life. He playfully compared today's "Google and Facebook generation" to his own: cell phones vs. phone booths, Wii vs. Pong, blogs vs. newspapers, Red Bull vs. Tang. Perhaps most notably, Schmidt said, members of his generation spent all their time trying to hide their most embarrassing moments. Today's generation records and posts all those moments on YouTube, he said, drawing laughter from the crowd.